Vegetation rarity rankings were assigned to the coarse filter conservation targets by the Vegetation Focus Team to determine appropriate protection levels. After identifying 556 coarse filter conservation targets (each vegetation type in every landscape unit is a conservation target), the Vegetation Focus Team assigned a rarity ranking from 1 (high) to 4 (low) to each vegetation type conservation target. Rarity rankings for the coarse filter conservation targets can be found in Appendix C: Vegetation Type Conservation Targets by Landscape Unit. Rank 1: Globally unique or highest priority locally rare vegetation types. Examples: Old-growth Redwood, Serpentine Grasslands, Valley Oak Forest / Woodland, Redwood Forest east of Napa Valley. Rank 2: Locally rare vegetation types comprising 5% or less of a landscape unit. Examples: Blue Oak / Foothill Pine Woodland in the Mt. Hamilton Landscape Unit, Douglas-Fir Forest in the Russian River Valley Landscape Unit, Montane Hardwoods in the Blue Ridge Berryessa Landscape Unit. Rank 3: Locally and globally common vegetation types, also referred to as matrix species, comprising more than 5% of a landscape unit. Examples: Blue Oak Forest / Woodland in the Mt. Hamilton Landscape Unit, Hot Grasslands in Blue Ridge-Berryessa Landscape Unit. Rank 4: Converted Lands that include Urban, Cultivated Agriculture, or Rural Residential land use areas that do not contribute to biodiversity. The map below displays the distribution of vegetation type conservation target rarity ranks. Rarity Rankings for a given vegetation type may vary from one landscape unit to the next, depending on its local abundance. For example, Oregon Oak Woodland is Rarity Rank 1 within the Sonoma Mountains Landscape Unit (only 788 acres mapped), but Rarity Rank 2 within the Sonoma Coast Range Landscape Unit (22,000 acres mapped). 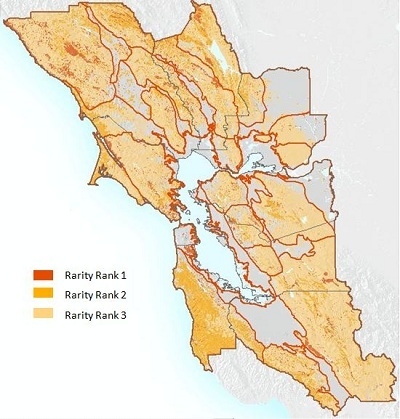 Similarly, Blue Oak Forest / Woodland is Rarity Rank 1 in the Sonoma Coast Range Landscape Unit (10Rarity Rankings for a given vegetation type may vary from one landscape unit to the next, depending on its local abundance. For example, Oregon Oak Woodland is Rarity Rank 1 within the Sonoma Mountains Landscape Unit (only 788 acres mapped), but Rarity Rank 2 within the Sonoma Coast Range Landscape Unit (22,000 acres mapped). Similarly, Blue Oak Forest / Woodland is Rarity Rank 1 in the Sonoma Coast Range Landscape Unit (108 acres), Rarity Rank 2 in the Sierra Azul Landscape Unit (5,523 acres), and Rarity Rank 3 in the Mt. Hamilton Landscape Unit (87,000 acres). The emphasis on local rarity within landscape units captures unique local biodiversity and environments in the Conservation Lands Network. Due to their uniqueness throughout the Bay Area, vegetation types associated with serpentine rock were always assigned a Rarity Rank 1, with the exception of the large tracts (~26,000 acres) of Serpentine Leather Oak Chaparral found in the Blue Ridge Berryessa Landscape Unit, which were assigned a Rarity Rank 2. Similarly, because of significant habitat losses, Riparian, Wetland, Dune, Native Grasslands, and Valley Oak Woodland vegetation types were always assigned a Rarity Rank 1. Using Rarity Rankings to Set Conservation Goals. Conservation goals for each of the 556 vegetation type conservation targets (vegetation type by landscape unit) were developed by determining the total acreage of each vegetation type in a landscape unit, applying the percentage protection goal (90%, 75%, 50%) and subtracting the protected acreage in the 2010 Bay Area Protected Areas Database (BPAD; see Chapter 3 (Approach and Methodology) for a full discussion of this database). Goals were not set for Rank 4 lands, which are anthropogenic vegetation types or Converted Lands and generally do not support biodiversity. The only exception to this methodology is the Central Coast Riparian Forest vegetation type. When the Converted Lands categories were added to the Coarse Filter Vegetation Map, the little riparian habitat that was mapped by CalVeg was removed. To compensate for this loss, all of the Central Coast Riparian Forest and Sycamore Alluvial Wodland vegetation types were added to the Conservation Lands Network after the final Marxan run. This step, described more thoroughly in Chapter 5 (Fine Filter: Riparian Habitat and Fish), brought the goal to 100% for the Central Coast Riparian Forest vegetation type. The table below summarizes the acreage goals for each vegetation type in the region. A more detailed table listing acreage goals for each vegetation type by landscape unit conservation target is found in Appendix C.